Hang Skateboard Completes on the Wall! Grab & Go Wall Hanger for all Skateboard Completes Works with virtually ALL Assembled Skateboards: Professional Grade Ultra Strong Steel Frame, Dual Wall Mount Screws for Ultra Stability, Innovative Design Cradles Truck Kingpin Center, Deluxe Padded Cradle Hook Arms Fastest Installation- Comes Fully Assembled All Rugged Mounting Hardware Included Sleek Black Satin Finish. Grab & Go Complete Skateboard Wall Hanger Rack Mount. 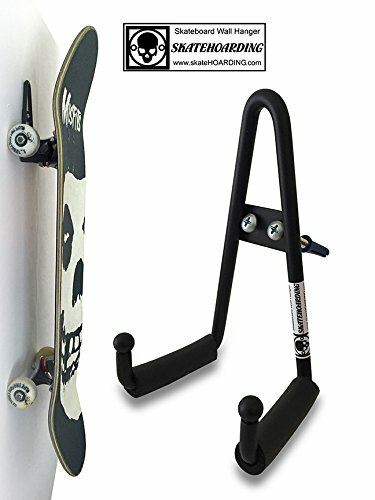 Brand new Skateboard Hanger from SkateHoarding Company. Our Grab & Go Skateboard Wall Hanger has the highest quality design, materials, and fastest/easiest installation on the market. Our new Professional Grade Welded Steel Frame Design wall hanger is designed for flawless functionality and a lifetime of service. If you have any questions about this product by SkateHoarding, contact us by completing and submitting the form below. If you are looking for a specif part number, please include it with your message.